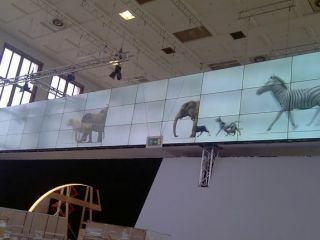 Sharp will show off what it describes as 'pioneering' video wall technology at IFA in Berlin. The electronics giant will show off a 'seamless' panel consisting of 54 60 inch panels – with the bezels of the televisions just 6.5mm. The display uses Sharp's new PN-V601 professional LCD panels and will show short films about the company. Grace Liang, Commercial AV Product Manager at Sharp Electronics (UK) said; "Our PN-V601 represents a new benchmark for the slim bezel monitor market. "With the new 60-inch screen size, a 13ft x 7ft video wall can be created with just nine monitors, where it would take sixteen competitive 46inch monitors to produce a comparable wall (100 square metres). "This also means significant reductions in overall purchase, installation and power consumption costs, depending on the final wall size."